This CellML version of the model has been encoded by the model author, Alberto Corrias, and is known to produce correct results in JSim and CellMLSimulator. It also passes the online PyCml validation tests with no errors or warnings. This model includes the specification of four pseudo ICC stimulus pulses with a 20s period. More information and simulation results can be found at the Computational Bioengineering Laboratory. The coordinated activity of the enteric nervous system (ENS), interstitial cells of Cajal (ICC), and smooth muscle (SM) cells is required to generate gastric motility. While the ICC provide a constant source of electrical activity, and can be regarded as the pacemaker of the gastrointestinal (GI) system, the ENS adds an extra level of control. In combination the ICC and ENS act as a stimulus, causing the SM cells to contract and generate slow wave activity in the GI. These regular, autonomous depolarisations are then propagated via gap junctions to the neighbouring SM cells in the gut wall. SM cells themselves are unable to generate or propagate slow waves autonomously. 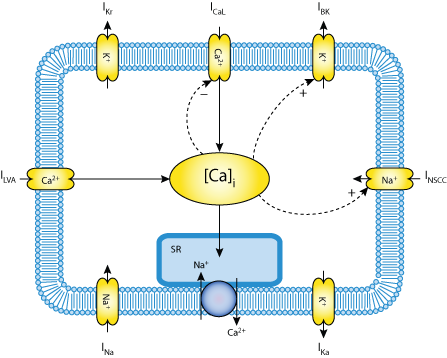 Instead they response to the electrical stimuli generated by neighbouring ICC as voltage-dependent ion channels embedded within their cell surface membrane become activated and other extracellular ligands and intracellular second messengers (such as calcium ions) also modify the response of the SM cells. As such, the inherent complexity of such a system quickly becomes apparent, and the role of mathematical models in dissecting the system and characterising the different functions of each individual component becomes clear. However, while computational models of cardiac electrophysiology have advanced considerably over the past few years, to date, models of gastric electrophysiology have been limited by the absence of single cell models which form the foundation for the more complex, large scale, integrated models. In the present study Alberto Corrias and Martin Buist address this issue by presenting an electrophysiolgical model of a single gastric SM cell. The model parameters are based on real, experimentally recorded, physiological data, and the model has also been kept relatively simple to make it computationally efficient, and therefore suitable for embedding within multicellular simulations. Derived from workspace Corrias, Buist, 2007 at changeset c9ad21ac1383.